Diversity has always been one of the many areas HR have had to keep in mind when attracting and recruiting talent. 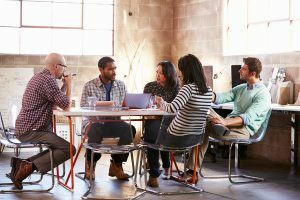 It’s widely known in the business community that a diverse workforce is a good thing, but why, what are the actual advantages for business owners and employees? Companies are often under pressure to be more diverse, because this is how they should look socially and as an employer brand. However businesses are constantly challenged by changing demand for products and services, new customers and markets in today’s world. The diverse workforce may be a key factor in helping brands to understand and meet the new needs of the modern business world. According to a study co-authored by MIT, switching from an all male or all female office to one with a mixture of genders can increase revenue by as much as 41%. In an age when flexibility and creativity are crucial elements of competitiveness, diversity is critical for an organisation’s success. Research has repeatedly shown that diverse groups are more creative and better at problem solving than homogeneous ones. Tapping into different backgrounds, experiences and skills allows ideas from varying perspectives to be shared and discussed. Employees with previous experience resolving certain challenges or problems mean that issues can be resolved quickly and efficiently. The greater your workforce’s collective knowledge the better. If you can deal with challenges in-house rather than outsource due to lack of the necessary skills then, as well as a more time effective way of dealing with them, there’s also a monetary benefit too. The greater a brands ability to adapt and innovate in order to quickly overcome the challenges it’s presented with will be the difference between success and failure. Experiences and skills can also be shared between employees when working in groups. This transfer of knowledge enables employees to learn and grow on a personal level and can help them progress their careers. Diverse teams working together will be able to achieve their goals faster and more efficiently by pooling their skill-sets and ideas. In 2004 a research study by a group of business professors from Washington University found that workplace groups that had diverse skill-sets were the most productive overall. The diverse experiences and skills enabled each team member to offer a unique contribution. These employees reported higher job satisfaction and earned a better wage while managers reported less turnover. Workplace diversity improves employee morale and encourages the desire to work more effectively and efficiently. Diversity in business leadership enables managers to introduce new skills and strategies for achieving cohesiveness within their teams. Unconscious bias should be addressed within the business and specifically HR and recruitment in order to ensure that diversity thrives. Talent attraction should be inclusive, employers should strive to attract applicants from as wide a talent pool as possible to nurture a diverse workforce. Being recognised as an inclusive employer not only enhances your marketing efforts but also your recruitment too. A successful employer branding strategy attracts the best talent by demonstrating that the company is a dynamic and innovative place to work, that it has its employees interests in mind and that it offers opportunities for personal and professional advancement. Increasing employee satisfaction, which helps attract new staff and retain those already there, reduces recruitment costs, and can increase productivity, creativity and communication. Candidates looking for their next employer will undoubtedly be attracted to those that demonstrate a diverse culture. Not only will people feel more at ease during their onboarding but a flexible and innovative employer offers opportunities for creativity, collaboration and growth.